Truly the place of a dream. It’s worth of the name. Look at the picture, isn’t it magnificent? This place located on the west coast of Bukit Peninsula, South of Bali. About four kilometers off the Ulu watu road. To access the beach you have to pass a gate which leads to a private villa park and passed the failed and unfinished project of Tony Suharto, the son of the old president of Indonesia. Not really a nice place to pass but soon you will forget the sight if you’re looking from above the hill with such an amazing view. The aquamarine color water and big waves!!! The beach is surrounded by cliffs, and it makes even lovelier sight from the sea. I think you would agree with me if you see such a view. If you’re a surfer, don’t miss the great opportunity to visit this dream place, it’s really worth it. The waves is great and powerful, they can even push you back to the shore. Just be careful, it could be painful if you’re bouncing to the stone on the beach. This is clearly not calm sea water, and if you’re looking for that, go to Nusa Dua beach or Sanur, the water is calm and very suitable for children. The beach is not really famous among the tourist. 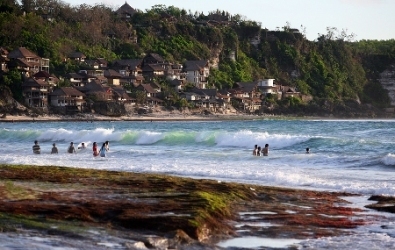 Most people go to Kuta for surfing, but if you’re looking for the alternative place than Kuta, this is certainly the place. This is more quieter beach and you won’t be bug by any hawkers, maybe some but not much. Some of the time the place would be crowded by surfer, especially on the holiday time but any other time, the beach is quiet pleasant and peaceful, and you would love it. Just choose carefully your data before you visit this place.